The chain of footpaths proposed in the 1960s continues from Hill Hook along Hill Hook Road for the next three-quarters of a mile. Hill Hook Road was laid out when the commons were enclosed, passing over the part of the commons called Lower Hook Field and then on to the Oslet. It is described in the Enclosure Award as “XXXII One other Road of the width of 30 feet commencing on the north side of the village of Hill in the late old Birmingham and Lichfield Turnpike Road over the commons called the Oslet and Lower Hook Field and terminating in the next hereinafter described road (Clarence Road) opposite the Hill Hook Farm late occupied by Thomas Cook”. In 1824 Parliament passed “An Act for enclosing lands within the Royal Town Manor and Lordship of Sutton Coldfield”, and on July 1st John Harris was sworn in as Commissioner to undertake the enclosure of the very extensive commons - over three thousand acres, one quarter of the area of Sutton Coldfield, was to be enclosed. One of Harris’s first acts, on July 3rd, was to appoint two surveyors, William Fowler and Henry Jacob, to make an accurate survey of the town, completed the following year and known as the Corn Rent map and schedule. William Fowler had already been engaged by the Birmingham and Lichfield Turnpike Trust to survey a new stretch of road to bypass Hill Village. His survey (part reproduced here) is dated December 1824, showing the new 40-foot wide 2,600 yard long road from Mere Green to Watford Gap in place of the old 2,618 yard steep and narrow turnpike road through Hill Village (now Hill Village Road). So when Enclosure Road XXXII was laid out, it followed the course of the old turnpike road across the common for a few yards before turning down towards Hill Hook, leaving the rest of the road (coloured green on the map) to be ploughed up and disappear without trace. The new Lichfield Road was completed in 1827, while Hill Hook Road was one of the 37 new roads across the commons inspected and approved by the County Magistrates in 1832. The railway bridge in Hill Hook Road was built over the Lichfield Extension Railway which opened in 1884, and the row of four cottages on the right was built to accommodate railwaymen. Crossing Lichfield Road on to Hill Village Road we follow Road XXXII to what was the north end of the village of Hill, where there is a footpath on the left. This was Harris’s footpath no. 35, laid out along the edge of the commons; the cottage to the left was built after 1830 on newly-enclosed land. 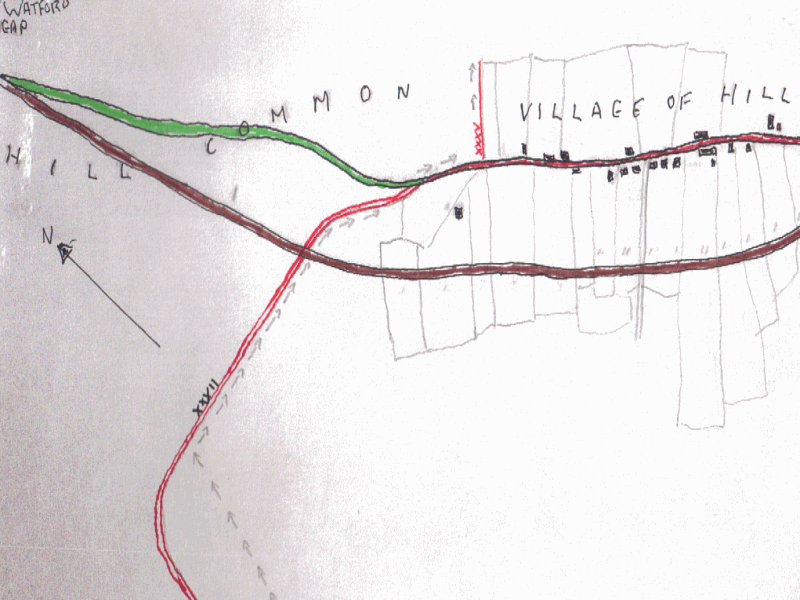 Part of William Fowler’s December 1824 plan for the Birmingham and Lichfield Turnpike Trust; the new road is coloured brown while the old road across the common to Watford Gap is green. Enclosure Road 32 (Hill Hook Road) has been added and the arrows mark the route of the chain of footpaths.